For Instant Pot and pressure cooker aficionados out there, we have amazing news: not only can you make wild salmon in your beloved pots, but there are various ways to go about it. You can bet on the fact that pretty much any wild salmon recipe can come together in under 20 minutes — if not half that time! — when you’re cooking under pressure. If you don’t own a pressure cooker or an Instant Pot yet, these recipes are so ridiculously easy that you might end up running out to buy one. This recipe is a blank salt-and-pepper slate for wild salmon fillets, cooked perfectly and effortlessly. Eat as is alongside a side of veggies for a simple, healthy meal. Or better yet, top the fillets with fresh herbs or lemon slices before cooking. While you’re waiting for the salmon to cook and for the pressure to be released, you will also have some time to pull together a quick sauce or dressing to drizzle over the finished dish. If fish sauce is a staple in your pantry, you’ll love this sweet, salty, and savory salmon dish inspired by the flavors of Vietnam. Serve over steamed rice or vermicelli rice noodles. An Instant Pot lets you build the caramelized sauce in the same pot in which you’re cooking the salmon. Note: If you’re using a pressure cooker without a sauté function, simply adapt the recipe so that you’re completing the sauté steps as you normally would on your stovetop. No time to thaw your fillets? No problem! This recipe was designed to cook up salmon straight out of the freezer. The fillets will steam up in a bit of water inside the pressure cooker, cutting the total amount of time you need for this recipe — including many hours of thawing — to a mere four minutes. Four minutes happens to be plenty of time for you to combine some herbs, spices, and fresh lime juice into a bright and palate-pleasing sauce to drizzle over the fish when you’re ready to serve it up. This is possibly the fastest and easiest wild salmon chowder recipe ever. The Instant Pot, or any pressure cooker, makes it possible for you to sauté your aromatic ingredients, cook through your potatoes and fillets of wild Alaskan salmon, and thicken everything into scrumptious chowder in about 20 minutes for a creamy, comforting lunch or dinner entree. A flavorful fillet of wild salmon is a worthy stand-in for chicken in this salmon tikka masala. Using a simple “pot-in-pot” tweak, making this recipe in an Instant Pot lets you cook the tikka masala sauce at the same time as you’re steaming marinated fillets of wild salmon. 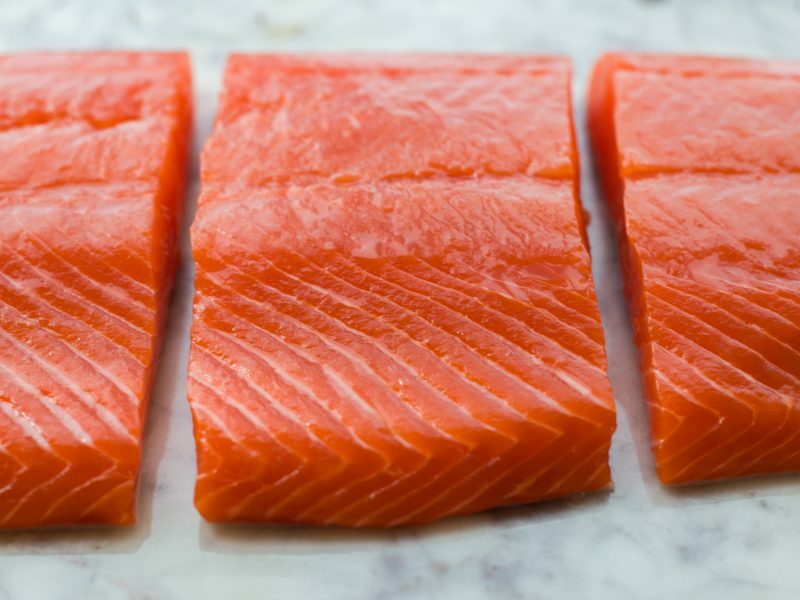 Cutting the fillets of salmon into large chunks, rather than bite-sized pieces, gives you enough surface for the marinade to cover without overcooking the fish; smaller pieces will always cook faster than larger ones, so try to cut up the salmon evenly. Another juicy bonus? Steaming is a gentler way to cook the fish so that it will stay moist and tender.